A great brisket rub and the low and slow method of smoking a brisket are the two most important keys to cooking a mouth watering, juicy, great tasting brisket. When you think about brisket, Texas style brisket seems to be the forefront of everyone's mind. Slow smoked brisket has its roots deep in the heart of the state. It would seem only natural that a Texas style brisket rub would be your number one choice when it comes time to cooking a brisket. The brisket rub you use will make a huge difference in the smoked brisket you are going to be cooking. Combined with the low and slow cooking method; you will have changed an ugly, tough cut of meat, to a tender, melt in your mouth, great tasting piece of meat. But it all starts with the brisket rub. A good brisket rub will not only make the brisket taste good, but it will help hold the juices of the brisket in the meat during the long cooking time. The perfect combination of salts and sugars will actually assist in the holding of those juices in the meat. Working together, they will create a self-basting mixture that keeps moisture trapped inside the brisket. Other spices enhance the flavor of the brisket thru the process that the sugar and salt are creating on the brisket and transfer those flavors down inside the meat. In addition to spices, salts, and sugars; it is great to have some large pieces of certain spices that will sit on the brisket over the long cooking time and continue to add their flavors. The great bark created from the sugars and spices will add the great appearance to the brisket. These sugars and spices will also give the bark a great taste when you take a bite into a piece of brisket. 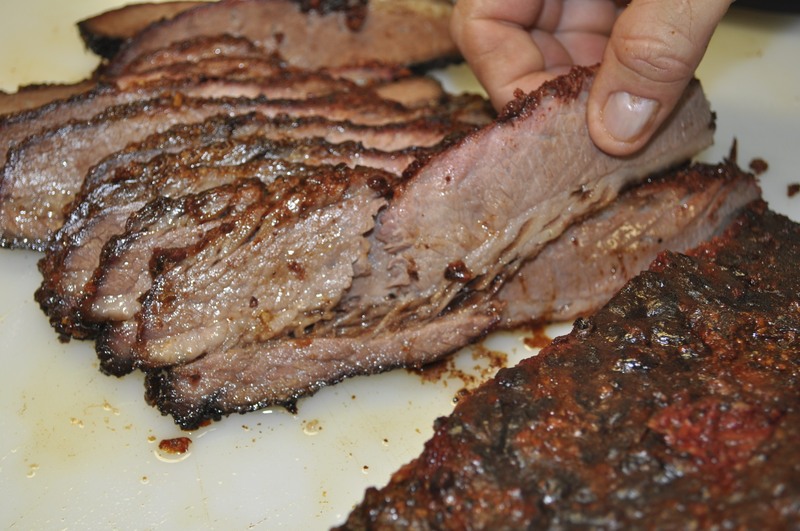 One of the most important benefits of a great brisket rub is that it will allow you to prepare a brisket quickly. You can get it on the smoker or oven without needing to go through a long marinade process that could even include refrigeration. If you are cooking a few brisket, it becomes even more difficult to find the refrigerated space to hold meat. A great brisket rub will eliminate the marinating time altogether and make preparation and clean up easy. Great rubs will work without sitting on the meat for long periods of time, so this is really an important point to save you time during the preparation stages of cooking meats. Texas BBQ Rub's national award winning Old. No 2 - Brisket Rub (2008 American Royal People's Choice Award of Rubs) is the rub for your brisket.